Why are readers scaling back on how much they read in 2015? I am a devoted follower of Book Riot. Bookriot.com is an online hub for readers to purchase book-related merchandise and talk about reading and writing. The articles posted on the site are composed by people who love adore worship (ah … there’s the right word!) the written word. So why are so many Book Rioters committing to read less in 2015? Shouldn’t lovers of literature want to read more? It mostly comes down to me wanting to accomplish more with my free time than just reading. I want to write more, I want to craft more, I want to do more woodworking. […] I even want to just socialize more and spend more time catching up with friends on the phone or over coffee. I don’t want my default activity for free time to be to grab a book and go lay down on the couch in my basement. Today, I also stumbled upon Jessica Pryde’s Book Riot blog post, Why I’m Not Participating in the Goodreads Reading Challenge in 2015. I was reading every chance I got. Not because I wanted to, but because I had to catch up. Have you ever gone onto Goodreads and seen that you were three books behind on your challenge? It’s nerve wracking! I felt like I ALWAYS had to be reading, no matter what else might be going on. The challenge was exacerbated by the guilt that I had so many books in the house, both paper and electronic, and felt that I needed to push through them. So in 2015, I’m going to give myself a year-long thirtieth birthday present. I should note that Pryde’s book tally was far higher than mine — in 2013, she read 189 books. Her reading goal for 2014 was 175 books. That’s about six times as many books as I planned (and failed) to read. Clearly her life was a bit more consumed by reading than mine was. But that’s what brings us back to Anderberg’s point about reading compelling us to action. Reading is an important part of life, but it shouldn’t become life. Just as a healthy work-life balance is needed, so is a healthy reading-life balance. Like Pryde, I am skipping this year’s Goodreads Reading Challenge. Although I still hope to read as many good books as life allows, I want to keep it fun and stress-free all year. 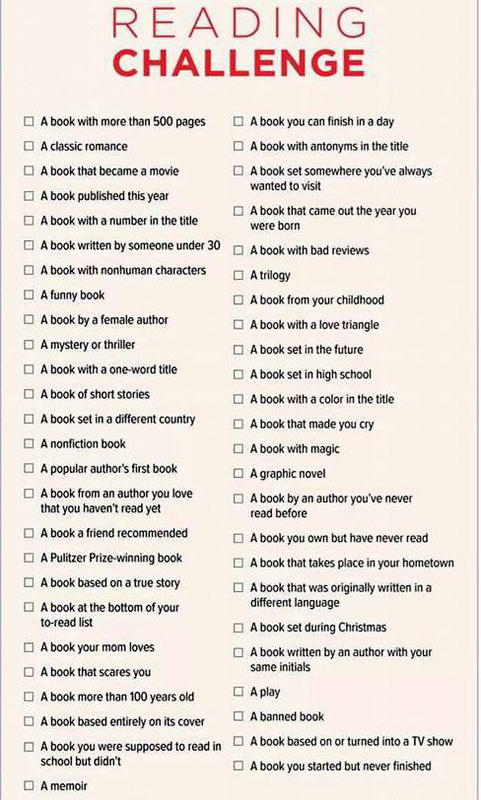 I’m still participating in a reading challenge of sorts for 2015, but I don’t plan to try to tackle all the different types of books on the list below. Instead, I plan to use it as a long-term scavenger hunt. This challenge may take me one year, five years or a decade. Someday I’ll have all the boxes checked off. But the point is to keep it fun and non-demanding. I want to be more purposeful in what I read. Certainly, there will be books I grab off the shelf for sheer entertainment. But I need to stop reading for quantity (goodbye, Goodreads challenge) and read for quality. Likewise, I want to take time to savor and absorb what I read, not rush through one text so I can tally it off and then grab the next one to read as fast as I can. There are all kinds of reading challenges people set for themselves, and they’re not always based on numbers. Some decide they’re going only read fiction, or read more books by women or authors of color. For 2015, let’s make reading challenges more about content and less about numbers. This entry was posted in Reading and tagged #amreading, Book Riot, books, literature, reading. Bookmark the permalink.